A Danish radio presenter allegedly beat a rabbit to death live on air to prove a point about the hypocrisy of meat eaters who are squeamish about seeing their food being killed. The stunt prompted an angry reaction from listeners. A campaign has been launched to boycott the program on Radio 24syv, according to Danish media. It all started with a debate on animal welfare. The radio host, Asger Juhl, allegedly cares deeply for animals, as accompanying Facebook posts on the radio station’s page tried to explain. But that reportedly didn’t save Alan – a nine-week-old baby rabbit. 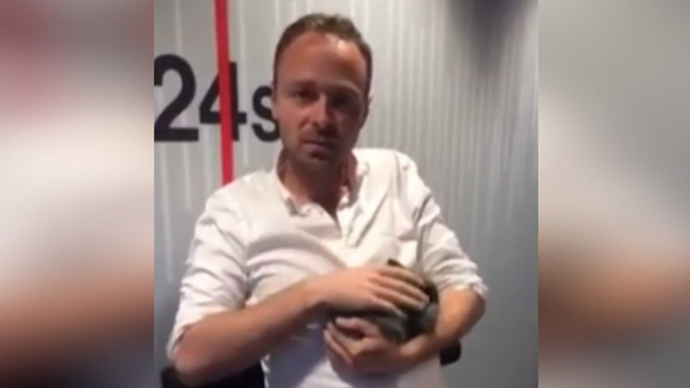 An animal activist from an earlier segment of the program tried to get into the session with the rabbit to try and save him, but failed, after allegedly chasing Juhl around a studio desk, according to Denmark’s TV2. A video was later uploaded with what looked like rabbit ragout in a boiling pot. Juhl claimed to have made good on his promise to skin and cook the rabbit later with his children. Others, however, weren’t convinced that this was animal cruelty: “What the heck is the problem if they ate the rabbit?” another user wrote. Others called for the program to be boycotted. A subsequent post by the radio didn’t attempt to hide what was perceived as animal cruelty by animal welfare campaigners and bystanders. The post claims that the provocation was deliberate, and that “Yes – we wanted to provoke,” it read. “But not as an empty provocation. We beat an animal to death to eat it…” Their point is that this is precisely what has happened to the meat we buy from the butcher or supermarket every day. The post goes on to emphasize that Allan had a good life, while animals that end on butchers’ hooks are victims of an industry that doesn’t care about their well-being. Denmark is controversial when it comes to killing animals. There is an annual tradition on their Faroe Islands involving the ritual slaughter of whales that literally turns the sea red with blood. Needless to say, animal rights campaigners around the world are trying to get this grisly practice outlawed. Inciting yet more controversy, last year a Danish zoo killed a baby giraffe in front of children before dissecting it and feeding it to one of the lions. The zoo explained it was a way to prevent in-breeding and also designed to teach kids about anatomy.